Number 714 had been hit just four days earlier, on Opening Day in Cincinnati. A sellout crowd of 53,775 packed Atlanta Stadium for the chance to watch Aaron break what he himself called “the Cadillac of baseball records.”2 By all accounts, this was the largest home crowd to see the Braves since the team arrived from Milwaukee. Anticipation was high in this, Atlanta’s home opener. Mrs. Herbert Aaron, Hank’s mother, bragged to the press, “He does what his momma tells him and I told him to go out there tonight and hit. He’s going to hit it tonight.”3 The fans, including Governor Jimmy Carter, Mayor Maynard Jackson, and entertainer Sammy Davis Jr., were hoping she was right. They all braved the cold weather and tornado warnings to hear Pearl Bailey sing the National Anthem and to then watch history being made. Another Number 44, Al Downing, was pitching for the Los Angeles Dodgers. Atlanta countered with Ron Reed. Leading off the bottom of the second, Aaron never took his bat off his shoulder, walking on five pitches. Dusty Baker stroked a double to left, and when Bill Buckner made a fielding error, Aaron came around to score the game’s first run. (Baker was thrown out trying to advance to third base.) This, too, set a record. It was career run number 2,063, breaking Willie Mays’ National League record. Aaron eventually scored 2,174 runs, the exact same number as Ruth. The Dodgers responded in the third by starting with three straight hits: Steve Garvey singled, Bill Russell doubled, and then Downing drove a single into center field, plating Garvey and sending Russell to third. Davey Lopes grounded a ball to third baseman Darrell Evans, who fired home in time to get Russell. After Buckner popped out, Jim Wynn scorched a double to left, good for two more runs. The Dodgers quieted the crowd with their 3-1 lead. However, the next time up, Aaron was greeted by “a rousing, standing applause that rocked the house.”4 Evans reached on an error by shortstop Russell. Aaron took ball one, and then at precisely 9:07 P.M., local time, he swung his bat for the first time in the game, sending the “homer heard round the world”5 out of the park. It was a no-doubter, headed over the fence in left. Braves reliever Tom House jumped up from his seat in the left-field bullpen and “made a dazzling one-handed catch against the auxiliary scoreboard.”6 The score was tied, but the home-run record was not. The Braves continued their celebration in the batter’s box, at the expense of a rattled Downing. Both Baker and Davey Johnson walked, prompting Walter Alston, LA’s manager, to make a pitching change, and Mike Marshall trotted to the mound. Vic Correll hit a grounder to Lopes, who fired across the diamond to third, but , and everybody was safe. Marshall then walked Frank Tepedino, bringing Baker home. There was still nobody out. 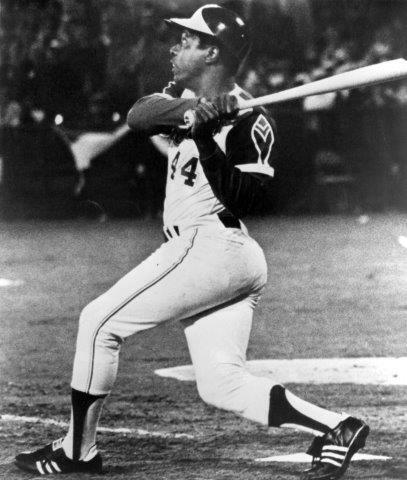 Reed popped to short and then Ralph Garr lifted a fly to left, driving in Johnson with the Braves’ fifth run. Fans continued their serenade as Aaron trotted out to left field in the top of the fifth. The standing-room-only crowd stuck around for one more at-bat by Aaron. In the bottom of the fifth, he grounded out, third to first, and the spectator exodus began. By the sixth inning, about 20,000 fans had departed.13 They missed the Dodgers tallying a run in the sixth with singles by Willie Crawford and Cey and Reed’s wild pitch. Within a half-hour of the historic homer, 60 congratulatory telegrams had been sent to the ballpark.14 President Richard Nixon telephoned the stadium shortly after the smash. Aaron was in left field when the call came through. Braves manager Eddie Mathews, a longtime teammate of Aaron’s, sent word that Hank could take the call between innings, and in the bottom of the sixth, the president and the ballplayer exchanged a dialogue,15 while the Braves continued to put runs on the board. Johnson singled but was forced at second by Correll. Marty Perez singled to right, and Correll sped to third base. Johnny Oates pinch-hit for Reed and hit a routine double-play ball to short, but Lopes dropped the throw at second and everyone was safe. (Correll scored.) Garr laid down a sacrifice bunt, but catcher Ferguson made an error, loading the bases. for the second out as Perez scored. Soon after Aaron finished his phone call, the score was 7-4. Buzz Capra pitched the final three innings for Atlanta, setting down nine of the 10 batters he faced. He allowed a walk to Buckner but struck out six Dodgers hitters. The Braves had ensured that Aaron’s historic feat would be remembered with a victory. In addition to the sources mentioned in the notes, the author consulted baseball-reference.com and retrosheet.org. 1 Wayne Minshew, “Aaron Hammers No. 715 And Moves Ahead of Ruth,” Atlanta Constitution, April 9, 1974: 1. 3 Jeff Nesmith, “Yowie! Yowie! Yowie!” Atlanta Constitution, April 9, 1974: 1. 4 Jesse Outlar, “’Hammer’ Flips a Page in History,” Atlanta Constitution, April 9, 1974: 57. 6 Joseph Durso, “Aaron Hits 715th, Passes Babe Ruth,” New York Times, April 9, 1974: 1. House ran to home plate and gave the ball to Aaron, disappointing the hundreds of fans in the bleachers hoping to catch the ball, which might have been worth tens of thousands of dollars. Aaron, a spokesman for Magnavox Co., later said that House would receive a free Magnavox television for making the catch. 10 Ross Newhan, “No. 715 … It Belongs to Aaron and Nobody Else,” Los Angeles Times, April 9, 1974: 41, 44. 13 “Crowd Thins Out After 715,” Atlanta Constitution, April 9, 1974: 62. 15 “Aaron Is Congratulated by Nixon After Homer,” New York Times, April 9, 1974: 50.